Bhagavad Gita Art Gallery--Plate 6: The insulting of Draupadi.. 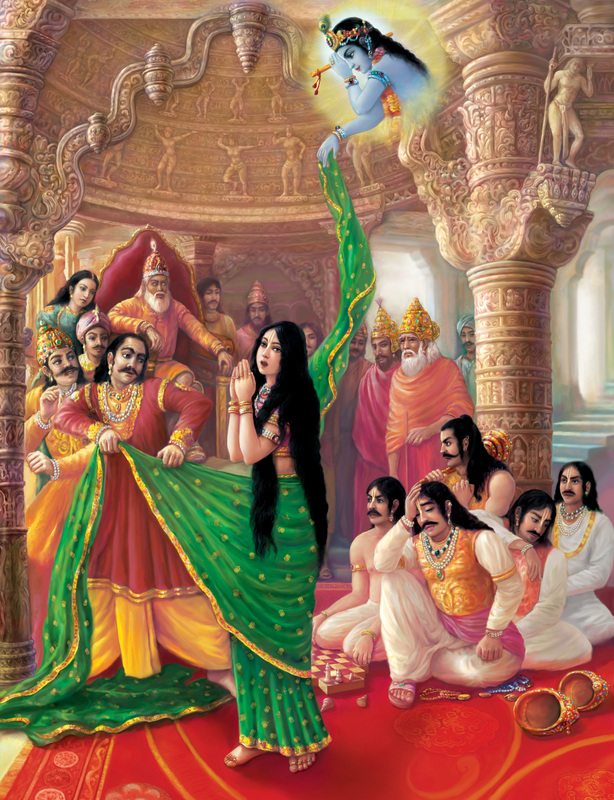 PREVIOUS Bhagavad-gita 1.33-35 Draupadi, the wife of the Pandava brothers (Arjuna, Maharaja Yudhisthira, Bhima, Sahadeva and Nakula), is being disrobed by Duryodhana and Duhsasana, two sons of Dhrtarastra, after being lost to them in a gambling match. Dhrtarastra is sitting on the throne. Krsna is becoming Draupadi's infinite robe to save her from being seen naked by the assembly. Because of this incident and other offenses to the Pandavas, Krsna wanted the battle to take place and the miscreants to be killed.